Is there a better alternative to Portfolio Optimization? Is Portfolio Optimization really the best app in Spreadsheets category? Will Portfolio Optimization work good on macOS 10.13.4? Portfolio Optimization needs a rating. Be the first to rate this app and get the discussion started! The Portfolio Optimization template identifies the optimal capital weightings for a portfolio of financial investments that gives the highest return for the lowest risk based on the return risk profile and correlation between individual investments. The design of the portfolio optimization model enables it to be applied to either financial instrument or business stream portfolios. The portfolio optimization template is intuitive and flexible with help icons throughout to assist with input and interpretation of output results. Input of historical data for the analysis is supported by options to specify absolute prices or returns, number of current units held and a tool to download long time periods of financial market data for securities from the internet. Advanced optimization options include setting minimum and maximum constraints for weightings in the optimal portfolio and risk analysis options for overall volatility under the Sharpe ratio, downside risk or semi-deviation under the Sortino ratio and gain/loss under the Omega ratio. Optimization can be set to maintain at least the current level of return and specify a target return for which the probability of attaining is calculated via Monte Carlo simulation. 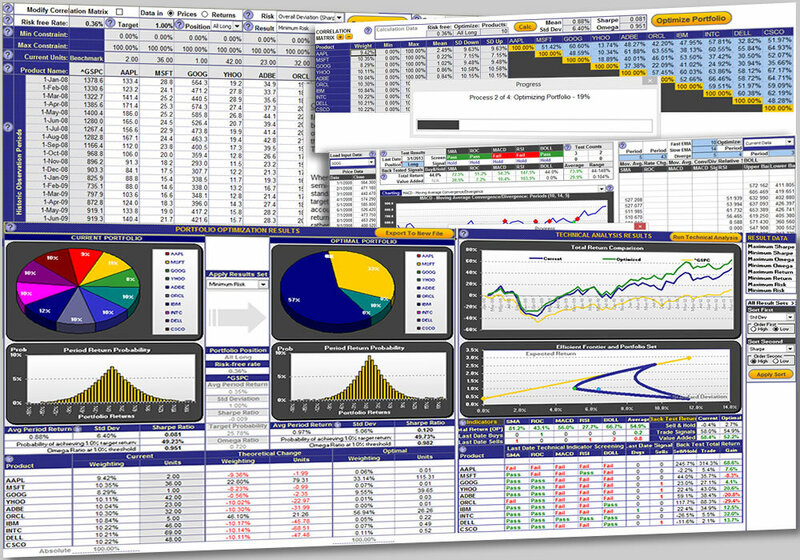 The portfolio optimization results are displayed with weighting charts and return distributions as well as acquisition and liquidation actions required. Technical analysis is provided with back tested total return from signal trading and automatic optimization of technical period constants for each investment or the total portfolio that results in the highest back tested return. Technical analysis indicators with detailed charting and back testing analysis include simple moving average (SMA), rate of change (ROC), moving average convergence/divergence (MACD), relative strength index (RSI) and Bollinger Bands.